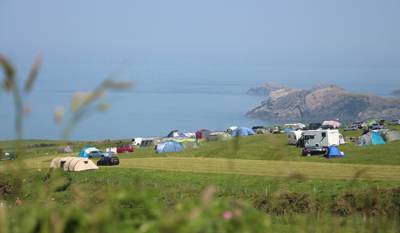 West Wales has everything you need for the perfect camping holiday. Some of the best beaches in the UK – great for surfing, swimming and rock pooling – and a dramatically carved coastline of high cliffs and quiet coves. Inland, green hills and lush valleys provide scenic camping locations while seaside campsites are an obviously popular choice. Whatever you chose we’ve got it covered. Browse our hand picked selection of the best campsites and glamping spots in West Wales below and book your next break online today. Head to the Hills and go camping in the Preseli Hills, Pembrokeshire - browse Cool Camping’s collection of campsites in the area, you’ll find scenic campsites, glamping spots and back-to-basics tent camping. We'll take care of everything – all you need bring is your sense of adventure. Of all the country's tent-ready destinations, West Wales offers endless opportunities for camping. Taking in the counties of Carmarthenshire, Ceredigion, and Pembrokeshire (a triumvirate known by its ceremonial title of Dyfed), Wales' far flank is chock full of fantastic places to pitch your tent. 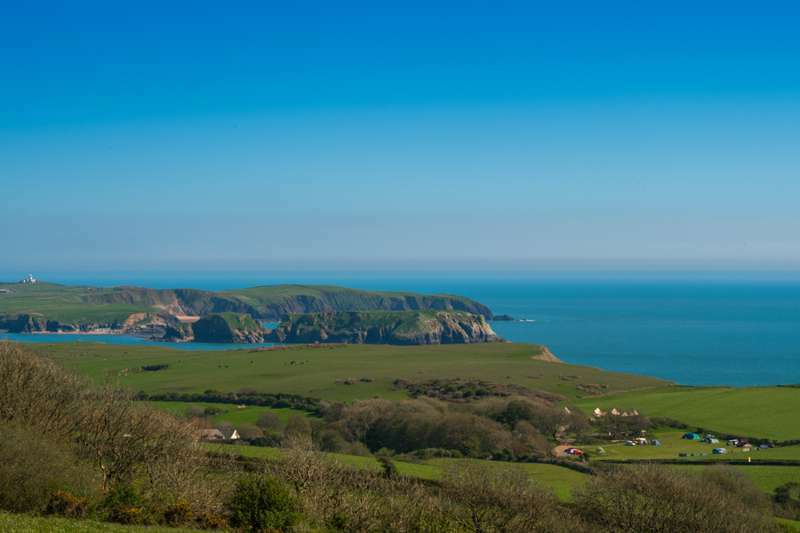 Camping in West Wales is a pleasingly varied bag, from small-scale independent campsites on the coast to little-known gems hidden amongst the hills. Many of the more back-to-basics ‘on the farm’ campsites adopt an informal approach and allow campers to find their own pitches amongst the acres of grass fields or paddocks. For those more regimented sites, set pitches are laid out for campers with many featuring electric hook-ups and water taps (always be sure to check with the campsite management whether the water is safe to drink). 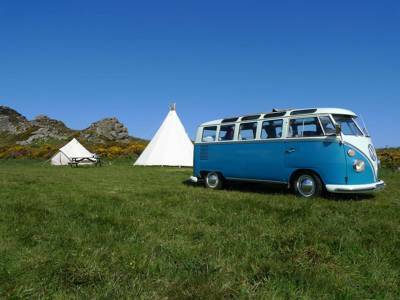 With miles of stunning coastal roads and mountain routes to explore, it’s no surprise that many campsites in West Wales also offer ample provisions for campervans too. As one of the UK’s most popular camping destinations, there are a ubiquity of holiday parks in West Wales. Most of these more commercial enterprises are ideal for caravans (several also accommodate motorhome rallies) and many also provide mobile homes, chalets, bungalows and static caravans, plus bars and restaurants. But our guide eschews these more commercial places for an altogether more small-scale feel. All sites featured meet the stringent Cool Camping quality control measures, ensuring that we only showcase the best places to camp in Wales. Top of the list comes campsites with campfires. The majority of Cool Camping-approved campsites welcome campfires, so you can while away the evening toasting marshmallows and stargazing beside the flames. And for those with a four-legged friend in tow, we also pick the best dog-friendly campsites (as well as a healthy number of campsites that do not permit dogs). All in all, we rate the sites we have selected as promising some of the finest camping in the UK. For those whose idea of roughing it is more treehouses and hot tubs, there’s a glut of glamping in West Wales to enjoy. So why not leave the tent in the cupboard under the stairs and try a luxury pod, shepherds hut or yurt for your West Wales getaway. Whatever type of camping or glamping you opt for, you’re all but guaranteed great views, a warm welcome, and an abundance of things to do in one of the UK's most magical destinations. With the dramatic peaks and seascapes of Cardigan Bay and the Cambrian Mountains, Ceredigion encapsulates the natural beauty West Wales is so famous for. Formerly known as Cardiganshire up until 1996, Ceredigion is one of Wales’ most sparsely populated counties. Besides the largest town, Aberyswyth (whose term-time population is bolstered by the number of university students), the largely rural dwelling population are dotted across cute villages and acres of sheep-dotted farmland. The sheer breadth of green, open space makes this an ideal place for camping. An abundance of Blue-Flag beaches, quaint harbour towns, and Mid Wales location means there’s no shortage of fantastic days out to enjoy away from the campsite. From spotting Cardigan Bay dolphins from the harbour at New Quay, to refined dining at The Harbourmaster in Aberaeron, or fishing for wild trout in the River Teifi. Camping in Ceredigion promises an authentic slice of Welsh rural life – the area is arguably one of the country’s most authentically Welsh, with the vast majority of inhabitants speaking Welsh as their first language and a proud people deeply in touch with their cultural roots. 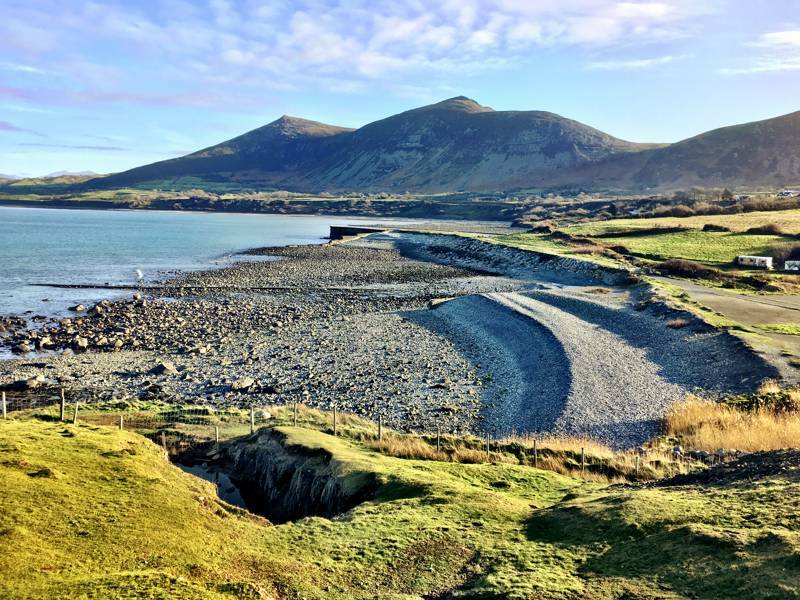 Campers and glampers can expect to spot a profusion of wildlife including deers, foxes and red kites circling overhead, while the 60-mile long Ceredigion Coast Path promises spectacular view of the breathtaking coastline. 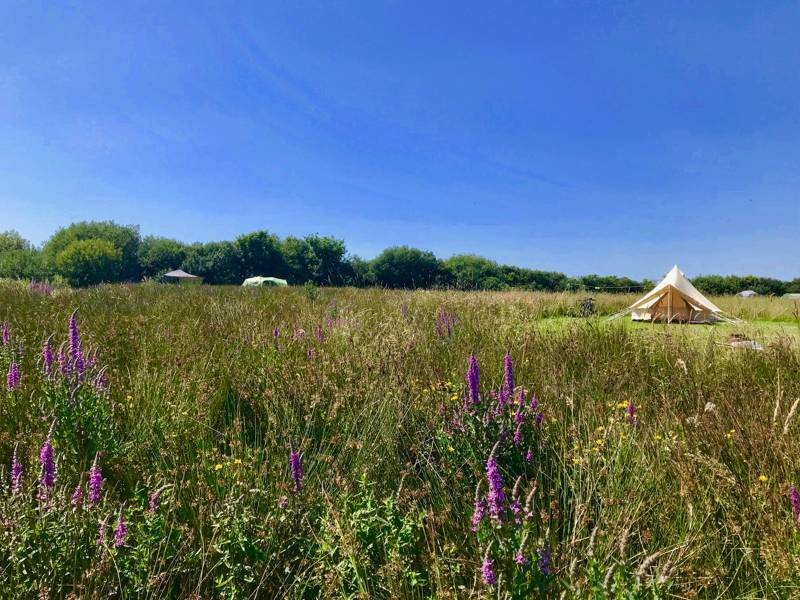 Camping and glamping highlights include a safari tent and hot tub getaway near Aberporth beach and an unspoiled eco retreat and conservation area on the fringes of Lampeter. All this makes Ceredigion one of the finest places to camp in West Wales. The star of countless slick tourist board campaigns and swooping aerial shots of its rugged coastline, Pembrokeshire is undoubtedly one of Wales’ standout attractions. With some of the world’s best beaches, historic medieval treasures, quirky villages brimming with independent shops, and a thriving culinary scene, it’s little wonder why Wales’ port-side promontory tops many a ‘places to see before you die’ list. 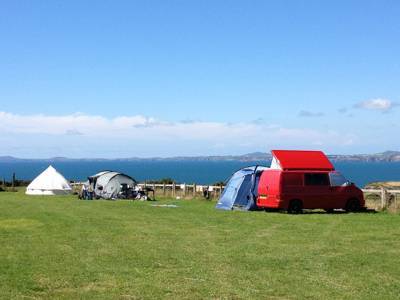 And it isn’t just the travel writers that fawn over Pembrokeshire’s many delights – campers have been coming here for years to pitch-up in some of Wales’ best campsites. When people talk about camping in Pembrokeshire, they usually mean sticking up a tent on one of the many campsites on the Pembrokeshire coast. Britain’s only designated coastal national park, its 236 square miles are best explored via the Pembrokeshire Coast Path which stretches from St Dogmaels and the Teffi estuary at its northern tip to the southern seaside settlement of Amroth near Tenby. En route, the path takes in pristine golden sands and hidden coves at the likes of Abereiddy, Freshwater Rest, Manorbier, Saundersfoot and Stackpole on the Pembroke peninsula. Campsites within strolling distance of the coastal path are plentiful and there’s many a spot boasting a beach within reach. Many campsites boast stunning panoramic views across St Brides Bay to Grassholm, Ramsey, Skokholm, Skomer and the Bishop and Clerk Islands and the sunsets on this seascape are ones that will linger in the memory forever. But Pembrokeshire campsites aren’t confined to the coast and visitors to these parts would be missing out if they didn’t explore some of the more inland charms, such as the Presell Hills. Sometimes referred to as the Preseli Mountains (although technically its highest peak, Foel Cwmcerwyn, falls around 250ft short of mountain status), these stunning wild moorlands offer unparalleled views across Pembrokeshire. From its loftiest walking routes, you can even see across to Ireland and Snowdonia on a clear day. There are plenty of places to go camping in the Preseli Hills, including a hill-top hideaway that offers exclusive whole-site hire, luxury yurts, and panormaic views over Strumble Head. Set between Pembrokeshire to its west and the Brecon Beacons to its east, camping in Carmarthenshire is often overlooked by virtue of its position between these more instantly recognisable of tourist-friendly regions. But this vibrant county in south-west Wales retains a distinctive identity all its own. Verdant valleys, enchanting woodlands and a richly varied coastline make Carmarthenshire a ready-made destination for camping. Throw into the mix ancient pre-historic sites, Arthurian legend and the literary lineage of Wales’ most famous writer, and there’s no denying that Carmarthenshire is one of Wales’ best-kept camping secrets. In days of heraldry, Carmarthenshire was the largest of Wales’ thirteen historic counties. Now its populous is largely dispersed between rural settlements and the three largest towns of Carmarthen, Ammanford and Llanelli. The region is heavily agricultural, with means an abundance of campsites on working farms. Most on-the-farm campsites allow guests to muck-in with the daily chores such as milking cows, feeding new-born lambs and collecting eggs from the resident hens, making them some of the best campsites for kids in West Wales. Carmarthenshire’s unique coastline presents yet another perspective on West Wales camping. In contrast to the rugged sea-battered cliffs of the Pembrokeshire coast, Carmarthen Bay’s vast estuaries – fed by the River Loughor to the east and Tywi, Taf and Gwendraeth (the Three Rivers Estaury) to the west – make for an altogether flatter coastline. ­But it’s no less spectacular for it and arguably offers a far more diverse coastal camping experience. There are endless sandy expanses like Pendine Sands and St Ishmael; the marram grass and sand dunes of Pembrey Beach; and, of course, the stunning Gower Peninsula juts out into Carmarthen Bay, home to the tidal marshes that produce the grazing for that Welsh delicacy, Gower salt marsh lamb. So wherever you opt to pitch your tent, there’s sure to be a beach within reach. Away from the campsite, there’s a wealth of places to visit and things to see and do in Carmarthenshire. The region is dotted with well-preserved castle ruins like Kidwelly Castle, Llansteffan Castle and Carregg Cennen Castle. Or spend the day at the National Botanic Garden of Wales in Llanarthne - an internationally-recognised horticultural centre boasting one of the world’s largest glasshouses. Try your hand panning for gold at Dolaucothi Gold Mines. The pretty estuary village of Laugharne is synonymous with Dylan Thomas – join the literary trail and visit the great poet’s old haunts including the famous boathouse and writing shed, now a museum. Or, for a flavour of the national obsession, head to Llanelli to see the Scarlets rugby team in action. The wealth of luxury camping options in West Wales are testament to both the region and experience’s ever-growing popularity. Glamping is no longer the novelty it once was. When the term was first coined around the millennium, it raised more than a few eyebrows and dismissive tuts amongst the camping purists. But it is now a firmly established stalwart of the British holiday scene and shows no sign of going anywhere anytime soon. And while West Wales will always be a mecca for old-school campers and those campervan fans, there are now arguably just as many glamping sites in West Wales as there are great places to pitch your own tent or plot up a caravan. In fact, the Welsh were among the earliest exponents on the joys of yurt glamping, with some of the UK’s original yurt sites found in Pembrokeshire, Ceredigion and Carmarthenshire. 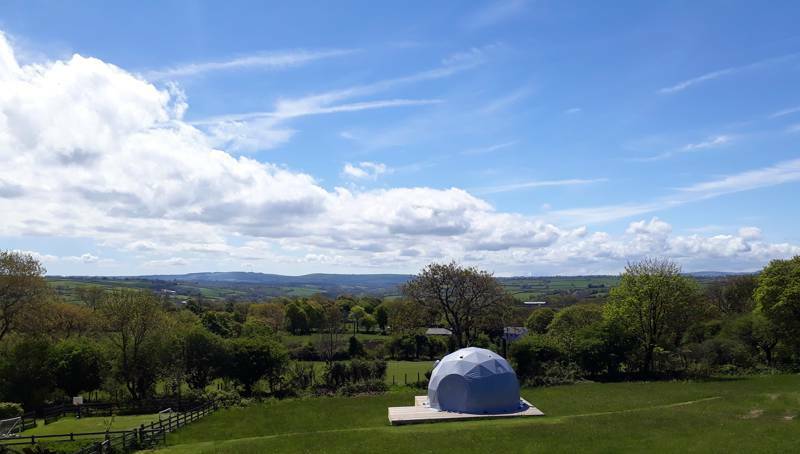 And it isn’t hard to see why – with their open-air crowns readymade for stargazing, the yurt is a natural fit for the clear night skies of West Wales. 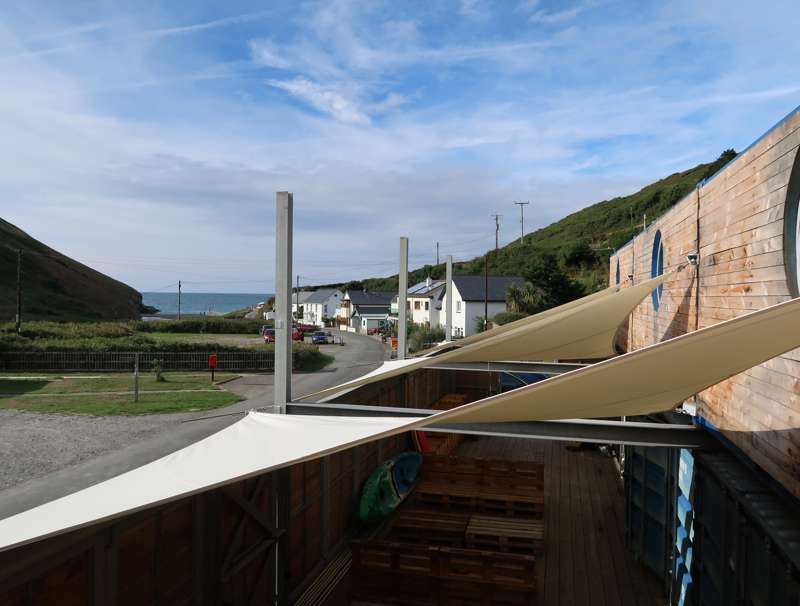 Many campsites in West Wales offer a mix of camping and glamping accommodation while some are exclusively glamping, positioning themselves as a luxury alternative to a night spent in a tent. There is very much a scale to glamping in West Wales, from basic but comfortable bell tents, to high-end treehouse retreats replete with hot tubs, en-suite bathrooms and gourmet hampers provided. Pods are another popular choice for glamping in West Wales. With miles of accessible paths and mountain trails, lugging cumbersome camping gear around is simply not an option for many of the dedicated walkers exploring West Wales every year. 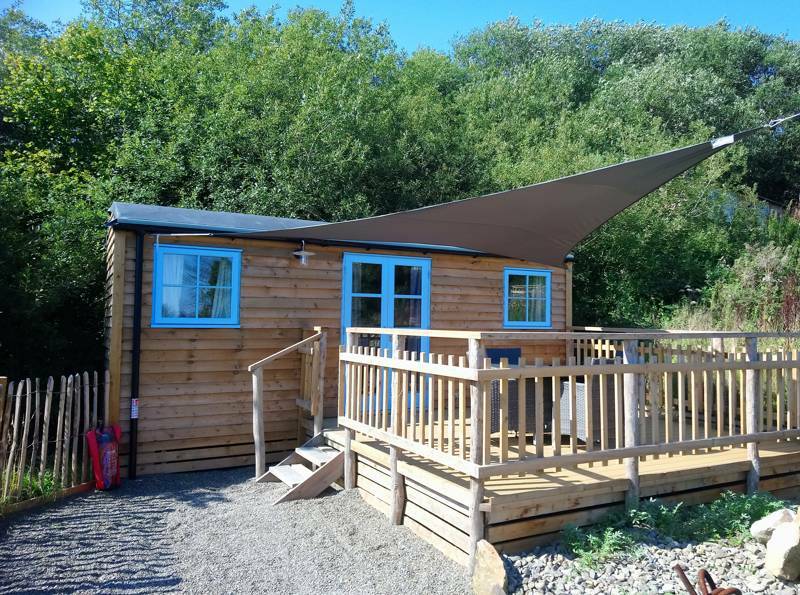 So by opting for a Pembrokeshire pod, walkers on the coast path can travel light safe in the knowledge that these sturdy timber-framed cabins present a reliable, weather proof alternative to canvas. And let’s face it, the Welsh weather is tempremental at times. What can start out as a glorious summer’s day can abruptly yield to gale-force winds and lashing rain (likewise, the gloomiest of days can roll over the mountains and out to sea as the sun emerges for sustained periods). So what could be more romantic than having a cosy cwtch with your nearest and dearest beside the wood-burning stove in a genuine Welsh shepherds hut? You can’t get more Welsh than that. West Wales at Campsites in West Wales, West Wales is a Mecca for camping and there are few better places to go. If you’re looking for a West Wales campsite you’ve come to the right place. All chosen by the experts behind the Cool Camping guidebooks, this collection includes seaside campsites, rural campsites, dog-friendly campsites, tent-only campsites and campsites where campervans are welcome too. Every one has the Cool Camping seal of approval and can be booked online at the very best price!